After all our celebrations last week I have been in an ‘after-parties-let-down funk’ and have resorted to eating mass quantities of dark chocolate and chips and salsa as college boy returned to Boston and the new graduate headed for the hills with his gf’s family to camp. Suddenly, I was faced with my first real taste of the empty nest. I hated it. To trade one vice for the other I crossed over to the dark side of retail therapy of the pink kind where there is little hope of turning back. They are cute and flirty, but really ~ I have rationalized my purchase by saying even if I don’t send them out as invitations I can cut off the ‘You’re Invited’ and use them for note cards. Never mind they will then fall short in the envelope. This is an emotional malady, remember. There is no common sense apparently. 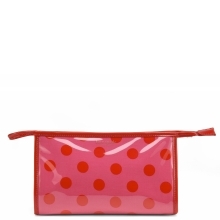 My second purchase to attempt to feel in the pink again was this lovely KS cosmetic bag. 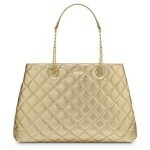 I ordered it from the sample sale and it is perfect all wrapped up in tissue and the brass pull protected. What is a sample sale anyway if the item is new and perfect? I didn’t know what to expect so I was pleasantly surprised by that, however, in my hazy funk I misread the price and thought I bought it for $35 when in fact the price was $53. I didn’t want it that badly. I don’t think I even wanted it at all. I have oodles of cosmetic bags. I hope it likes its new home in the closet still wrapped up in its tissue and plastic finery. We need to have alone time together to bond and become close. I’ll bring the chocolate, chips and salsa. Please tell me I am not flying solo with questionable shopping decisions. 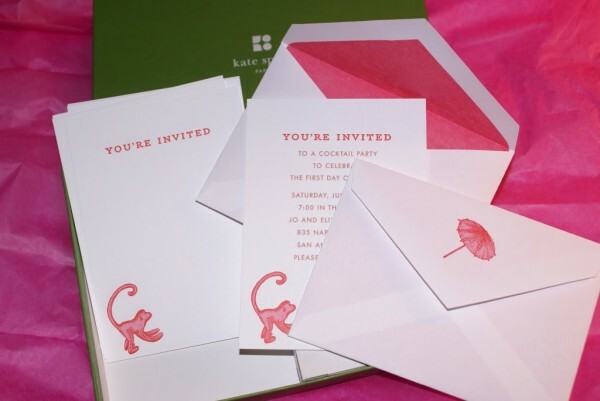 Those invitations are pretty fabulous!! I can totally understand buying them even if you aren’t hosting a party. You are not flying solo I’ve been online shopping instead of waiting until I’m in the states a month from now. Vices are the devil!! 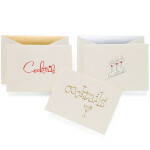 Love the stationary. Loving the invitations and the cosmetic bag. I understand… sounds like you need to have a little yard sale or start giving them as thank you gifts!!! Remember its okay to feel like crap & let the pink come back on its own. I found over my years trying to force happiness never works. its her time again. You deserve that & so much more. I’ve been loving that stationary for so long now! I’m so glad someone has bought it! Haha I just love how buying those invitation cards bring forth so much reasoning for and against 🙂 When I find myself in that situation, just go with the simple answer, I just need them because they’re fabulous! I always lust over these when I walk by them! I am SO glad you got them and on sale no less. Your idea of snipping off the top and using them as note cards is too perfect for words. Love it!